Last week I wrote that we’re supposed to be a church as a whole, a church everywhere in the world. We’re supposed to go out into the communities of the world to figure out who needs help. And then we’re supposed to get together and help! This is exactly what we’ll be doing in Redwood City, California on December 3, and I would love to meet some of my readers there. Please contact us at Generation Alive to volunteer. We’re going to package 135,000 meals to send to southern Ethiopia, so that starving refugees will have something to eat. This isn’t our first event. 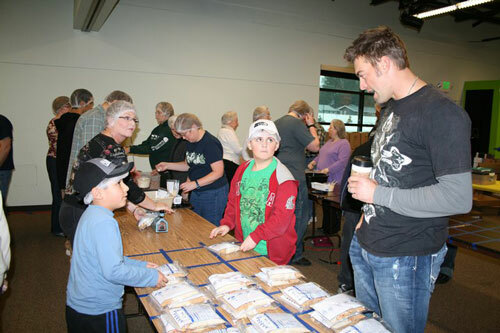 We had our first event last January in Spokane, when young people stepped up as leaders and led their community to feed the hungry. It was amazing to see their excitement about doing something totally selfless. They said, “We want to serve. We want to serve people who are hurting. We want to get outside of our own selfish needs. We want to help other people, because we have and they don’t.” At any age, fifteen years or three years, that’s pretty exciting. When the day came, we didn’t know what it was going to be like. Some businesses had contributed, but we really didn’t have much in the way of advance donations. It didn’t seem like the donation button on our website was getting pressed a whole lot. There were kids lined up outside the door of the auditorium, down the side of the building, and into the parking lot. And it was 25 degrees out. I mean, it was cold! We had to take the kids through orientation, and we could only take twelve at a time to show them the process of packaging meal kits. Then we’d put them to work and take twelve more kids through orientation. And then we would take twelve more, and so on. We did our best to keep the line moving so the kids wouldn’t get too cold, but they stood outside and waited their turn anyway. They were ready. These kids didn’t want an autograph. They didn’t want to have a baseball card signed. They didn’t even want to talk baseball. They wanted to talk about social justice! “Why are we not being told about people suffering from hunger?” they asked. “We want to help.” And they were excited. They would say, “I have an idea, why don’t we do this?” They were brainstorming with us on the spot! All anyone had to pay was 25 cents. That would buy one meal kit. But they all wanted to do so much more. And they did. At one point in the afternoon, a church walked in, and one of the youth pastors said, “I’ve been praying and fasting all month for my kids to do this.” He had $2500.00 in quarters that his young people had raised. My jaw dropped! That’s 10,000 meals! His kids had gone from house to house. They knocked on doors and said, “We’re going to bag meals and feed someone who’s hungry. All we need is 25 cents. Do you have any spare change?” That’s all they did. And they raised $2500.00! My two nephews and my niece brought in $150.00 worth of quarters that they had raised. My oldest nephew is seven, the next is five, and my niece is three years old. They brought in quarters, and they bagged meals. We packaged 75,000 meals for the food banks in four hours! And seeing kids from three years of age to parents in their 40s working together like this was just a fulfilling, phenomenal experience. Our goal in December is to package 135,000 meals. Please help! This entry was posted in Discipleship, Generation Alive, Hunger, Youth Ministry and tagged Future Profits, Generation Alive, Matthew 25, Northern California Urban Development, Something to Eat, Youthfront. Bookmark the permalink. What a great testimony of the “church” pulling together. Too bad we are 6 or 7 hours away from Redwood City! God bless your efforts again this year. Looking forward to reading about how the Lord will provide for all those meals needed! To God be the glory!